Summary Intel Core i3 seven-bay BYOD NAS with USB 3.0, HDMI and 10 GbE port, supporting multiple volumes and filesystems with many serving options. When we reviewed the 7-bay Thecus N7710-G last year, we noted that it was one of the more aggressively-priced NASes that had more than four bays and built-in 10 GbE. Since then, Thecus has produced a next-generation version, the N7770-10G that is the focus of this review. Looking at the product comparison chart below generated on the Thecus website, you see the two products are virtually identical with the exception of the processor and the amount of included and total memory supported. This comparison provides a good overview of common features and specifications of the two devices. Thecus' seven-bay chassis hasn't changed since the N7710-G, or, for that matter from when we first saw it in the N7700. The front door still has is secured with a push-push latch and no lock. And each of the drives sits in a lockable tray that has light pipes to carry power and activity / error lights forward from the drive backplane. Since the cases are identical, I'm going to just re-use the callouts from the previous review. The rear panel view below shows four more USB 2.0 ports for a total of six. There are also two USB 3.0 ports, dual Gigabit Ethernet ports that support link aggregation and both HDMI and VGA ports for monitor attachment. The blank slot at the top of the photo below should show the single RJ45 10GbE port provided by Thecus' C10GT PCIe card. The NIC compatibility list shows other 10GbE NICs from Emulex and Intel and other vendors that alternatively could be user-installed. The table below summarizes the N7770-10G's key components, plus two other NASes we'll be using for comparison later. The Thecus N7770-10G was fairly difficult to disassemble to free the main board. So CPU and RAM information was taken from the specification sheet. The other components listed were assumed to be the same components used in the N7710-G. As shown, the memory is expandable up to 32 GB using compatible memory. Four WD Red 3 TB (WD3000FYYZ-0) provided by WD were used for testing. Total power consumption with all drives spun up was 51 W and 35 W with them spun down. Fan and drive noise was rated Medium High - mostly because of the system fan. The Thecus N7770-10G is currently running on Thecus OS 5.0. 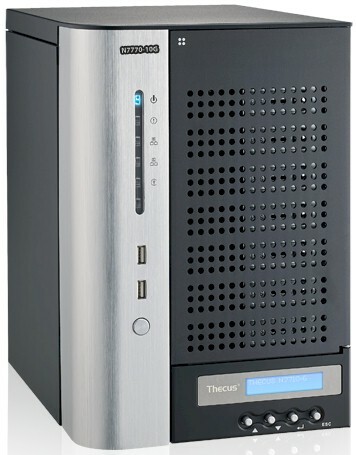 Some of Thecus's other models have received an updated OS, ThecusOS 6.0. For those of you who are interested, there are live demos of both operating systems available here. The image below shows the N7770-10G landing page. The features of the N7770-10G are otherwise the same as the N7710-G, so we won't be covering them in this review. Performance tests were run using the Revision 5 NAS test process using firmware version 2.05.12. All tests were run using Western Digital Red 3 TB drives (WD30EFRX) generously provided by WD. For comparison in this review, I chose the seven-bay Thecus N7710-G and five-bay QNAP TS-563. I chose the QNAP TS-563-8G as it has excellent 10 GbE performance and its base price of $709 plus $220 for a single port 10 GbE NIC makes it very competitive price-wise with the $949 Thecus N7710-G. I filtered the NAS charts for the latest testing method (black bars) and RAID5. For many NASes, the performance is limited not by the ability of the NAS to handle a heavy load, but rather the limit of Gigabit Ethernet and a single client. As we've seen in recent reviews of mid to high-end NASes, the test results for File Copy Read and Write were between 109 and 110 MB/s - about the maximum you can achieve with Gigabit Ethernet. This was the case for all three NASes in our comparison. You can tell a lot more about the performance by looking at the individual test results shown in the benchmark summary for each individual product. For these comparisons, I've created a composite image which shows the benchmark summaries for the N7770-10G, Thecus N7710-G and QNAP TS-563. For File Copy Read and File Copy Write, all three NASes maxed out the Gigabit Ethernet connection for all three tested RAID levels. On the majority of the NASPT tests, the QNAP TS-563-8G outperformed both of the Thecus NASes, and in quite a few cases, the N7710-G actually outperformed the N7770-10G. The TS-563-8G turned in the best USB 3.0 backup results by a significant margin for all three file formats tested. It's worth noting again the Performance Ranking takes into account only Gigabit Ethernet performance. Our charts currently contain 32 products that are RAID5 capable. Unfortunately, the N7770-10G didn't fare very well. The QNAP TS-563-8G tied at #4 with other QNAP products. The Thecus N7710-G actually had a better ranking (#13) than the N7770-10G sibling, which ranked at #18. The composite chart below shows Ranker performance summaries for the N7770-10G, Thecus N7710-G and QNAP TS-563-8G. The TS-563-8G outperformed both Thecus NASes in every category except for backup and iSCSI. For backup, while the TS-463-8G had great scores for USB 3.0 backups to an external drive, the category score was pulled down by significantly lower Network Backup scores. Using a 10 Gigabit Ethernet LAN connection better shows what these products are capable of for large sequential file transfers. The TS-563-8G had exceptional read performance. It handily beat the other two NASes in every read-intensive test. The Thecus N7770-10G, however, outperformed the other two NASes for many write-intensive tests including File Copy Write and NASPT File Copy to NAS for all RAID levels. The TS-563-8G had the best performance for iSCSI read performance while the N7770-10G grabbed iSCSI write performance bragging rights. We don't include 10GbE results in the NAS Rankings because not all products support it. We now have nine 10GbE capable products in the NAS Charts that are shown in the composite chart below. For File copy write, the Thecus N7770-10G placed near the top of the charts for RAID 0 and had chart-topping performance for RAID 5 and RAID 10. The QNAP TS-563-8G was in the middle of the pack for all RAID levels and the Thecus N7710-G came in lower than the QNAP. For File copy read, the results were completely different. The TS-563-8G topped the charts for all three RAID levels. The Thecus N7770-10G came in a distant third behind the TS-563-8G for RAID 0 and RAID 5. For RAID 10, the N7770-10G came in fourth. The differences in read performance are worth noting. For RAID 0, RAID 5 and RAID 10, the QNAP TS-563-8G was 221.0 MB/s, 331.4 MB/s and 342.5 MB/s faster than the Thecus N7770-10G for corresponding RAID tests. If you're looking at the seven-bay N7770-10G, you either need a lot of storage, a lot of performance or both. If storage is your main criteria, and you don't intend to use a 10 GbE connection, there are much better NASes that offer better Gigabit performance as well as more than four bays. For example, in addition to the five-bay QNAP TS-563-8G, there is the six-bay $752 QNAP TS-653 Pro and eight-bay $994 QNAP TS-853 Pro. If you need at least a five-bay NAS to meet your storage requirements and your immediate connectivity needs don't include 10 GbE, the QNAP TS-563-8G is an excellent choice. It provides near top-of-the Ranker Chart performance as a Gigabit NAS as well as unmatched File Copy Read performance for all RAID levels when tested with a 10 GbE connection. You can always upgrade it to 10GbE if the dual gigabit Ethernet ports using link aggregation don't provide sufficient bandwidth. If you really need both the storage capacity offered by a seven or eight bay NAS and are planning to use a 10 GbE connection, your choices become much more limited. The #5 ranked Synology DS2015xs provides eight bays and has built-in 10GbE. But you're going to be paying a $230 premium over the Thecus N7770-10G to get the extra bay (and the ability to further expand capacity via rather expensive expansion cabinets). For 10 GbE performance, the N7770-10G outperforms the Synology for both File Copy Write and Read for all RAID levels. The Thecus N7710-G, though $221 cheaper than the N7770-10G probably shouldn't be a consideration - especially if you plan to use 10 GbE. Priced at $1170 with built-in 10GbE, the N7770-10G provides excellent 10 GbE File Copy Write performance; important if you are going to use its massive storage for video applications. The N7770-10G also supports multiple RAID configurations with different file systems for different volumes. That could be important if you need volume snapshotting available with the BTFRS file system. If you need at least seven bays and 10 GbE performance, the best choice of the 10 GbE NASes we've tested is the Thecus N7770-10G.